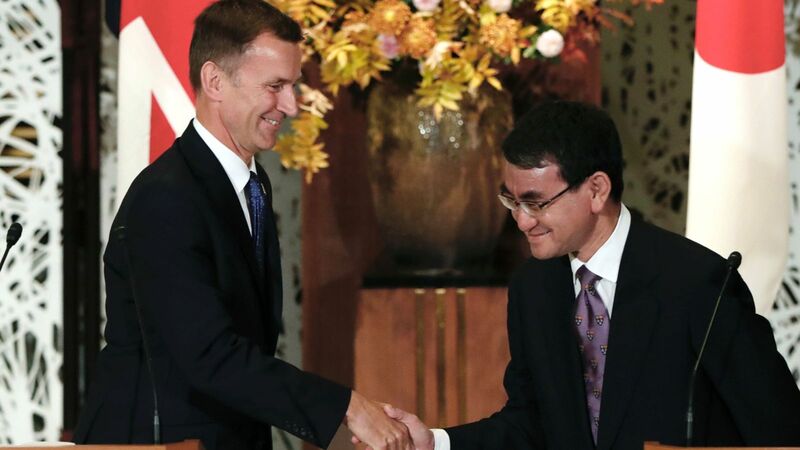 Jeremy Hunt has been praised for becoming the first UK minister to give a speech in Japanese. The foreign secretary revealed he lived in Japan for a year-and-a-half, praising the wonderful hospitality he received in their native language. Mr Hunt said he hoped the speech would strengthen the friendship between Britain and Japan “not least because for the first time there is a British foreign secretary who can speak a little Japanese”. Speaking on Tuesday, he said: “I came to this country for the first time in 1990 to learn Japanese. “I lived for eight months in Kyoto, then six months in Nagasaki, followed by six months in Tokyo. He continued: “Today, I am here to take forward the new era of friendship between Britain and Japan. “We have so much in common as two island nations who strongly support the rules-based international system that has delivered peace and prosperity for many years. “Our friendship stretches back to the Anglo-Japanese alliance of 1902 – and I am sure it will strengthen in the years ahead. Mr Hunt also poked fun at a gaffe last month where he told Chinese diplomats his wife, who is from China, was Japanese. He was commended by social media users for his delivery in Japanese.